To transform the way we interact with music. It is music… without instruments. A concept he calls… Musica Biotronica. Created by Ain TheMachine, Musica Biotronica takes sounds from the body, voice & everyday objects, and with the help of technology, transforms them into music. A symbiosis of organic and synthetic, its purpose is to redefine our relationship with music and demonstrate that music is accessible to all, a universal right. 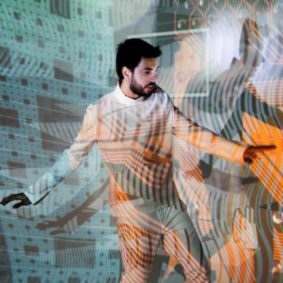 His interactive live shows are not just a music performance, they are an immersive audio-visual experience, where the audience is actively involved in the creation of the music.​ By using the universal language of music, Ain has created an innovative way to communicate with audiences independent of language and cultural barriers. From collecting sounds in Shanghai for a worldwide clothing brand to playing in the Brazilian embassy in Sarajevo, Ain has been involved in a diverse range of artistic and commercial projects. He has also developed the Musica Biotronica concept into a wide spectrum of live and video formats that have caught the attention of some of the world’s biggest brands. From Google, Samsung, Mercedes Benz, Bosch/Siemens and more, Ain has helped brands engage their audience and their employees in exciting and innovative ways, by using music as his main communication tool. Ain expertly combines the commercial and creative in a natural way that creates a meaningful connection between message and audience. In more than 12 years, Ain’s music has taken him across the world, to London, Madrid, Paris, Milan, Bilbao, Berlin, Sarajevo, Sao Paulo, Brussels, Luxembourg, Barcelona, Buenos Aires, Shanghai and Miami. Ain is always searching for new ways to communicate and connect through music. By mixing and experimenting with different concepts and disciplines, he is continually developing exciting new formats to redefine our relationship with music. Explore creative and innovative ways to deliver your message and engage your audience, contact Ain TheMachine now.